In my time as a mom, I have experienced amazing moments: the first time I held Bridget in my arms, rocked her to sleep, watched her roll over, crawl, and take her first steps. And then there’s the long hug to welcome me when I pick her up from daycare, the conversations on our drive home when she tells me all about her day and we giggle even though neither of us know what she’s saying, and reading her favorite stories before bedtime. There’s the throw-her-head-back laughter when I play “Santa” with bubbles at bath time, or watching her and Daddy knuckle-bump and simultaneously say “boom”. There’s been so many amazing moments. But perhaps my most favorite is hearing Bridget’s new(ish) four word sentence: “I love you, Mommy,” “I love you, Daddy,” “I love you, puppy.” These words echo through our house, over and over again, and it generates an instant smile on my face every time. Early motherhood is rewarding in subtle ways. 3 AM wake up calls don’t scream “thank you”. Dirty diapers can feel like a tiresome routine. And the regular hunt for something anything that a picky toddler will eat can be challenging. But then there are these amazing moments that bring you back to reality. The reality that motherhood is a blessing; a privilege; an opportunity to do something meaningful, with greater purpose than your own. 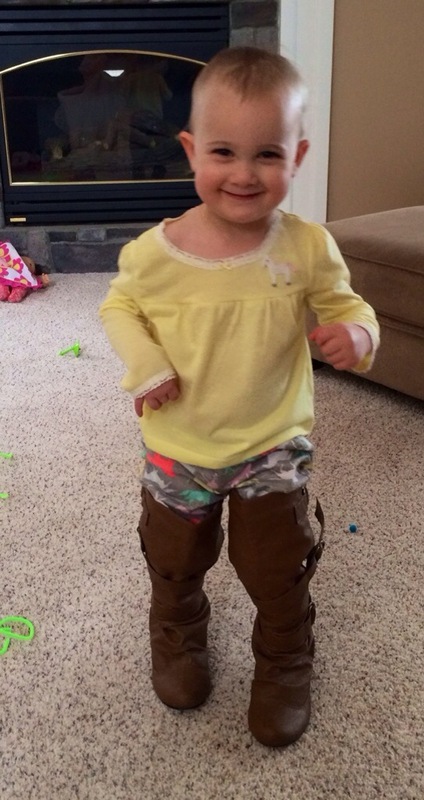 Bridget trying on my boots. Don’t worry, she didn’t get far in them. This is what we hear quite regularly at our house when we try to put on Bridget’s coat, help feed her, attempt to wipe her nose, or buckle her seat belt. The humor and reality of this statement raises a mix of emotions for me. 1) It makes me laugh every time she says it. Every time. 2) I’m glad to see her becoming independent, and I know her stubbornness strong will will be an asset in life (when in check, of course). She’s so eager to learn and experience things, and I hope she never loses that desire. 4) It’s a subtle but constant reminder that our baby girl is growing up. This sounds so cliche, but it seems like yesterday that she was just our little bean. You’re right, Bridgey. You’ve got it. And I am so grateful to get to witness it. 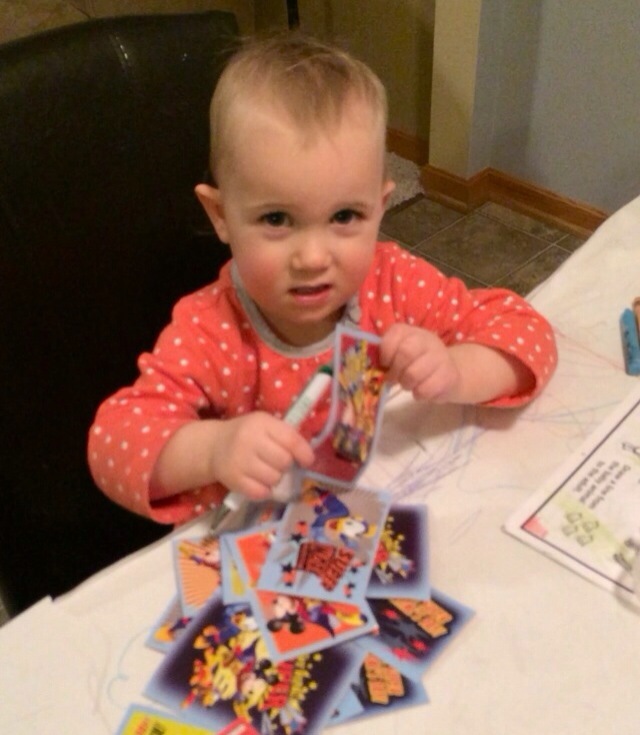 Bridget writing out Valentine cards for her classmates. She had a big smile on her face when she said “Leo”. Tired of the frigid temps and non-stop snow? Us too! We’ve exhausted our play room and the mall playground. Unfortunately it’s too cold to get out and play in the snow, so we ventured out and experienced beautiful CLE’s offerings. In January, we visited the Cleveland Metroparks Zoo. Thanks to the thoughtfulness of my coworkers, we have an annual family membership, so we visited the Rainforest and the Aquatics & Primate Center (all indoors and heated!). I love the zoo any time of year, but felt like we found a hidden gem this round. Apparently people either don’t realize it’s open year round or they stay in during this weather because it was basically empty. Front row parking, no lines, heated shuttles, and up close and personal with the exhibits…it doesn’t get much better than that. This past weekend, we visited the Children’s Museum in University Circle. I’ve heard mixed reviews on this venue. Some parents love it, others don’t. We really enjoyed it aside from the drive, somewhat expensive admission ($8 per person), and my germophobia in high gear. 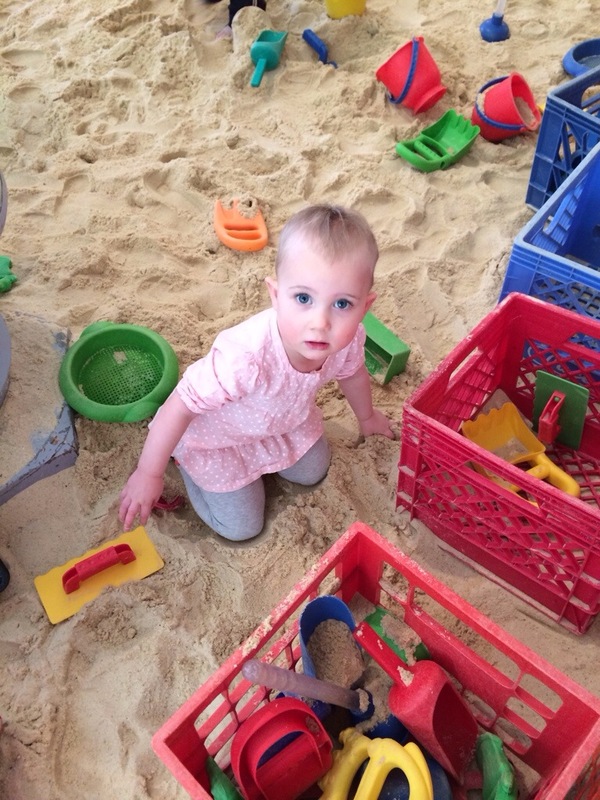 There is so much to do there: a farm experience, bus, grocery store, bank, house, hospital, water table, weather center, and Bridget’s person favorite, the large indoor sandbox. We could have easily spent the day there, but we’ve learned our lesson the hard way. No one wins in a Bridget nap-free day. How are you beating cabin fever with kids? Thanks to good ol’ Phil, we’ve got another five weeks to occupy so ideas are welcome!